My son, who is the consummate adventurer, has left me a Tandem bike to sell (to help finance his current biking tour), he has left me at a disadvantage as I don't really know what to do to identify the bike. I have noted all the marks on the bike, and was wondering if some kind soul could help me to figure out what this is. He and his girlfriend took the bike on a six week tour from Oregon through California and loved loved loved the bike. The following is all I could find on the bike. I would love to get more info and/or to find out what is good (or bad) about the bike. Thanks - a frazzled, but supportive mom! There are numbers on the very bottom - Trek 985 667 (we think, although the number is a but fuzzy), Also a sticker that says 91 0677. (09-17-2013, 04:11 PM)sherryg11 Wrote: My son, who is the consummate adventurer, has left me a Tandem bike to sell (to help finance his current biking tour), he has left me at a disadvantage as I don't really know what to do to identify the bike. I have noted all the marks on the bike, and was wondering if some kind soul could help me to figure out what this is. He and his girlfriend took the bike on a six week tour from Oregon through California and loved loved loved the bike. The following is all I could find on the bike. I would love to get more info and/or to find out what is good (or bad) about the bike. Thanks - a frazzled, but supportive mom! The T50, T100 and T200 share a common frame and were made in the mid 1990s. They were originally equipped with cantilever brakes - not exactly center pulls. 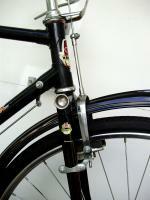 One of the pictures shows the cantilever brakes. The components you list were standard on the T100. The author is the owner/founder of Santana Tandems.